The Charmandean Centre, creating your special day, your way. Whether you are looking to hold a wedding reception, or a party to celebrate your civil partnership or renewal of vows the Charmandean is the venue for you. At The Charmandean we appreciate that everyone’s budget and ideas are different and so we have a range of packages available to make your day special, but affordable. With our selection of menus and drinks packages, we can cater for formal dinners and party style buffets. Please note our venue is not licensed for wedding, civil partnership or vow renewal ceremonies. We provide bar staff for your celebration to suit your numbers and with a wide selection of menus to choose from we can cater for all dietary requirements. 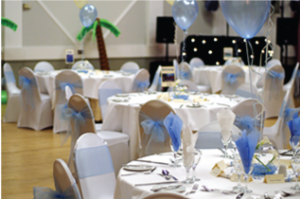 Our party style layout can include a dance floor or stage (available on request) at no extra charge. Our events team can assist you in planning your day so if there is something extra you would like to add or if you’d like to know if your ideas are possible please contact a member of the events team. Once you have decided on possible dates please contact us so that we can check availability of our function suites. At this stage we will make a provisional reservation for you. We will hold this reservation for 14 days. Within this time we will send you a written quotation . If you wish to proceed and book the venue you will need to sign and returned the booking form (quotation) together with a 35% deposit of the hire charge. In the unlikely event of cancellation please refer to the terms and conditions attached to your contract. Once we have discussed your basic requirements you can relax with regards to the finer details, these will be discussed with you three months prior to your wedding when we will invite you to The Charmandean. Menu’s need to be agreed during the meeting held three months prior to your event. The balance will be required 10 days prior to your wedding any additional charges will be invoiced to you after the event. 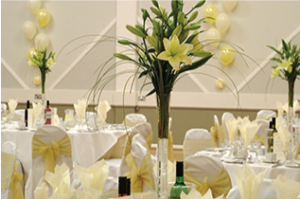 Seven days prior to your wedding reception we will require the final number of guests together with your table plan. Any specialist dietary requirements must be notified to us seven days prior to your wedding reception.